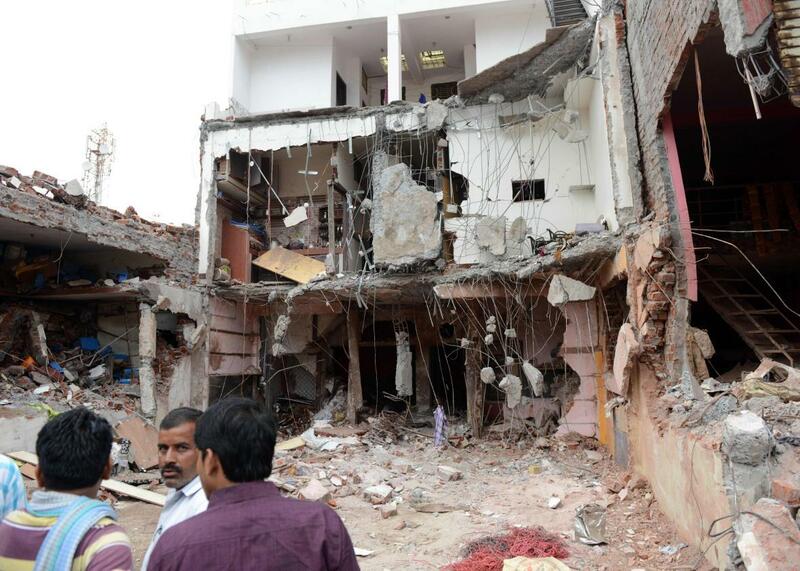 Blast near crowded bus stand in India kills at least 104 people. People walk near buildings that were partially damaged due to a powerful explosion at Petlawad town, in Jabua district of central Madhya Pradesh state, India on September 12, 2015. A massive explosion that ripped through a crowded bus stand and popular restaurant killed at least 104 people, and injured more than 100, in the central Indian town of Petlawad in Madhya Pradesh state, which is around 300 miles north of Mumbai. Earlier reports had said gas cylinders at a restaurant were to blame for the explosion, but officials later said mining explosives stored in the basement of a house were the first to detonate, reports the Los Angeles Times. The death toll is expected to rise as the powerful blast flattened three houses and the restaurant, leaving many people trapped in debris, reports the Hindustan Times. In addition, many of the injured were taken to hospital in critical condition. The explosion apparently began in the building of a company that has a license to use explosive materials for mining, reports AFP. But residents had apparently told authorities numerous times that the explosives were a tragedy waiting to happen. “The residents in the area had complained several times about the dangers involved in storing explosives in the middle of the city but he is a powerful businessman,” Mishra said. “Nobody addressed it.” Although mine operators have very specific guidelines they must follow in order to safely store explosive, they “are often lax, and the district authorities rarely act against them,” notes the Associated Press.